Every autograph can tell a story. 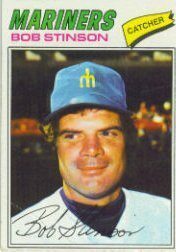 Harvey Meiselman, intrepid compiler of baseball addresses, sent customers an update about catcher Bob Stinson. Stinson has upped his signing fee by mail to $10 per autograph. Back in 2010, I wrote about Stinson’s dislike of the fabled SSPC set. The 1976 edition was unlicensed. College student Keith Olbermann (long before ESPN or political fame) got his first national taste of baseball journalism, writing the card backs. Stinson was the final holdout for Olbermann, protesting to the TV personality that the set was unlicensed. Yes, you guessed it, Stinson’s updated policy states he’ll sign Topps cards only. By the way, Stinson may just be repaying Topps for the huge faith the company showed in him. From 1970-72, he was on a “Rookie Stars” card…for three different teams. Catcher Bob Schmidt’s Final Autograph?